For me, “back to school” means teaching British literature at Montgomery Catholic Preparatory School. I am rather a newcomer to Catholic education, but its long and interesting history in Montgomery dates from 1873. Montgomery Catholic Preparatory School is the oldest continuous non-public K-12 school in Alabama. 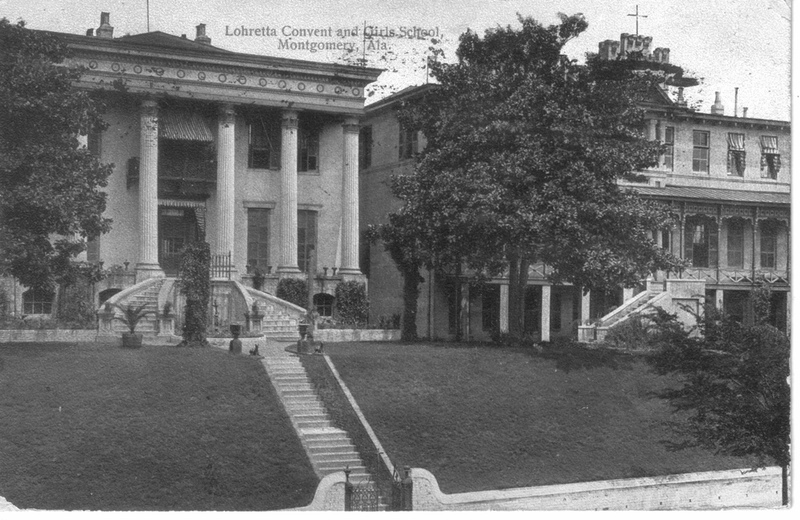 The Sisters of Loretto at the Foot of the Cross came to Montgomery in 1873 to start a school for girls. The sisters intended to begin their school immediately, but a yellow fever epidemic was sweeping the city, so they unselfishly postponed their school opening, provided a place for the ill, eased the dying, and nursed victims back to health. This endeared them to Montgomery’s residents. The sisters bought the Perley Gerald House, a classic Greek Revival style mansion built circa 1851 on the southeast corner of South Lawrence and Adams Streets. It was across the street from St. Peter’s Catholic Church. The spacious home was three stories and featured a ballroom, parlors, dining rooms, and bedrooms. They converted it into a convent and school – the St. Mary’s of Loretto Academy. Then, as now, many non-Catholic students were enrolled. Current Montgomery residents still remember going into the large antebellum mansion and being awed by its elegance. One of my friends remembers that the sisters who passed into the next life were placed in one of the parlors for a day’s viewing and remembrance before internment. An archival document describes a built-in vault with an iron-studded door accessible only through the use of a large iron key. Gerald used the vault for “personal wealth.” According to local legend, during Montgomery’s occupation in the Civil War, federal officers used it to hoard “company treasures.” The document goes on to state that the sisters used the vault “to conceal dust rags,” leaving the modern reader to wonder at the need for such a measure. The sisters continued educating the spirits and minds of young people at that location until 1962. In 1890, the sisters constructed a Victorian building next to the Gerald home, called the “Annex,” for classroom space. In 1938, the sisters built what was known as “the little red school house” on the site of Gussie Woodruff’s home and school. A new high school building, described by the Montgomery Advertiser as a “trim modern brick building,” was constructed at Adams and South McDonough, next to St. Peter’s Catholic Church and diagonally across from the Gerald House. It opened on January 12, 1952. In 1962, the Gerald Mansion was condemned. Father Powell led a building campaign and constructed the high school at its current location on Vaughn Road in 1965. The original entire block where the Gerald Mansion and school stood is now occupied by the Montgomery County Courthouse and the Phelps-Price Justice Center. Today, Montgomery Catholic Preparatory High School continues to serve students in Montgomery by teaching, loving, guiding, and molding them into “persons of faith, virtue, and wisdom.” Three campuses offer programs from kindergarten to twelfth grade: St. Bede’s Elementary on Atlanta Highway, the Middle School and High School on Vaughn Road, and the brand new Holy Spirit school, also on Vaughn Road. So, its back to school, and although I will miss what the two months of summer provide for me – time with friends and family (furry and human), and writing time – I am still proud to be part of going back to school at Montgomery Catholic. I went to school here 1958.-60. The photo does not do justice to the “old south” charm these buildings had. They are gone now, a shame. The nuns stayed in yet another building behind what you see in the photo. Most classes were in the added building on the right. The old 1851 mansion is on the left. There was a third building, more modern, off this photo further right for the youngest students . Nuns in their habits did most all the teaching. They actually cracked the knuckles of unruly children. This was an “old school non PC education very strict”. It was the best years of education in my life…I ended up with years of post graduate..but these years in that old mansion were the best ! I attended what my family called “Saint Loretta’s” for my fifth grade year, 1961-62. My father was stationed at Maxwell AFB and decided this would be a good school for my older brother, who had some emotional issues. Despite the fact that I was doing well at Maxwell Elementary, they thought it best to have me close to him. I enjoyed my time there, although my classroom seemed to be below ground level (as I remember it) and was very dark and somewhat musty. The next year, we transferred back to Maxwell. While there, however, I found an interest in journalism, and a fellow student and I produced a monthly almanac for our classmates. The next year at Maxwell, I started their school newspaper as well. Although my adult career went in different directions (first in Theatre, then as a History Teacher), I did spend about 5 or 6 years working for two different newspapers in Oklahoma. I started as a copy editor (glorified proof-reader in the time before computer spell-checkers) and ended as the Entertainment and Lifestyles Editor. I went back to Montgomery a few years ago, but the school was gone, as was (what I remember as) a museum just down the street. I used to spend my after-school time there while waiting for my Mom to pick me up.